Money - Muda #9Eliminate The Muda! « Lean Management, We Gave It To Japan – Is It Time To Take It Back? If you have not seen them yet, take a look at What Is Muda to learn about the other forms of waste. While adapted from a fast growing business management philosophy called Lean Management, these forms of muda (waste) can all be adapted for use in your personal pursuit of financial freedom and journey of personal productivity and organization. After all you are in the business of you. There have been many contributors to the philosophy of Lean Management over the last few hundred years. Among this list we can include one of the U.S. founding fathers, Benjamin Franklin, industrial revolutionist Henry Ford, the often unknown statistician Walter Shewhart and his disciple W. Edwards Deming. Beyond the shores of the U.S. we also owe gratitude to some visionary businessmen and consultants like Shigeo Shingo, Kiichiro Toyoda and one of Toyota’s lead engineers Taiichi Ohno. Taiichi, in particular, receives credit for formalizing and standardizing a number of different core concepts that make up Lean Management; among these were the 7 forms of muda (waste). We have reviewed each of these original seven forms in summary and in detail. Some time after Taiichi’s retirement he was interviewed about his approach to management and efficiency of operations. It has been reported that when asked about the 7 forms of muda, he responded “I never said there were only 7 forms of muda”. The 7 forms that he focused on were only the most common that he found in a manufacturing environment. One other form of waste he recognized at the time was the waste of employee ideas and talent. Beyond the 8 forms of waste identified and discussed previously, are there more? One form of waste that affects virtually everyone is the waste of money. Indirectly every waste identified by Taiichi was tied to money, the investments in his company or costs associated with its production. Money may not have been listed directly simply because in a factory environment no employee was directly paying for inventory or time from their pocket. For the purpose of personal financial management it is prudent to list this waste by name. We all pay cash, write checks, and charge for services and products directly from our pocket. In our case however we may buy products that are not inventories to be resold and these purchases are not generally for the purpose of generating sales or profits, they are consumed. The clearest example might be the purchase of perishables at the grocery store. If not eaten in a timely manner you are forced to throw them away. This is an obvious waste of money that may also include waste of your time and transportation. Another example might be the impulse purchase of a piece of exercise equipment that you never used. While you could sell it as used equipment you are not likely to get all your money back. Any difference was simply a waste. Take a look at this graphic from the Department of Labor. 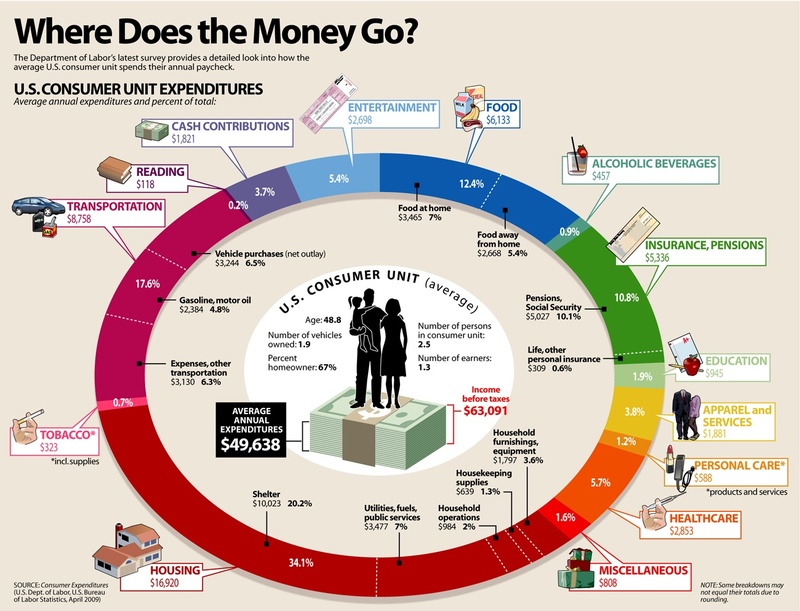 This reflects the average consumer unit (household) earning a little over $60,000 a year and spending just under $50,000 per year. Right away most of you may recognize the obvious choices to eliminate waste of money. Tobacco might be the first to go. After the obvious, finding additional opportunities to eliminate waste of money will depend on preferences and perspective. The single largest expense is housing at 34.1%. Every market is different but while it would be nice to live in the McMansion it is not necessary. A decade in a more modest home can help position yourself for something much nicer that you can comfortably afford. Next is transportation and this too has opportunities to save. While not directly applicable, waste of overproduction and overprocessing is over doing it. In this case “it” is the choice of cars. Do you need a new, gas guzzling luxury auto? There is not much difference between a nice Camry and a Lexus ES300 except price. You could save even more buying a low mileage 3-4 year old model. Gas can be reduced by making sure your car is well tuned and tires have proper pressure. Food is another major expense for most. It appears the average spends nearly as much out of the house as in the house. The only thought that comes to mind is “psycho” (Been there, done that, never again!). These averages provide some easy, quick and big opportunities to save. However, nearly 30% of the expense is made up of all the “little” expenses from entertainment to personal care. Consider the reality that everyone goes for periods in their life without mortgages and car payments, hopefully for many years in retirement you’ll have no mortgage. In this case, these “little” expenses which occur over your entire life may equal the major expenses, why not make just as much effort to reduce these costs and eliminate the wastes of money? CAN’T WAIT TO GET MY MICRO PIG!! !